I’ve never been able to consistently keep a journal or a diary. My entries tend to follow the form of rote lists – or complaints – about my day, hastily scrawled words that I want to rip out of the journal whenever I read over them later. Inevitably, instead of ripping I just stop writing. Lately, though, I’ve been consistently recording observations in a sturdy blue notebook, writing detailed notes at least once a week, notes that I don’t mind reviewing or thinking about weeks later. That’s because this notebook is highly specialized: it’s all about bread. 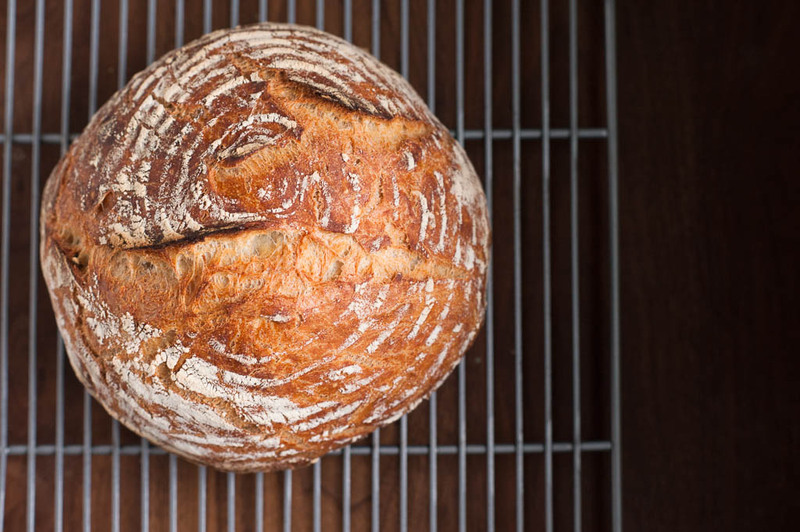 In September, I started baking bread once a week, a culmination of reading Michael Pollan’s Cooked, Ken Forkish’s Flour Water Salt Yeast, and Chad Robertson’s Tartine Bread. After reading these experts (well, two experts and one novice, in the form of Pollan) wax poetically about the romanticism of bread baking, the peace that comes from it, the pleasure in shaping the dough, and the smells that permeate one’s house (dare I say, soul? ), I baked my first loaf in September and haven’t stopped. As part of a bigger project about fermentation (more on that in the new year), I’ve worked my way through Ken Forkish’s book, which progresses from basic to complex (beginning with commercial yeast recipes, continuing to pre-ferments, and ending with the creation of a starter). I’ve simultaneously continued learning as much as I can about whole grains, enzymes, and proteins, with the ultimate plan of transitioning away from commercial yeasts to building and maintaining my own sourdough starter. 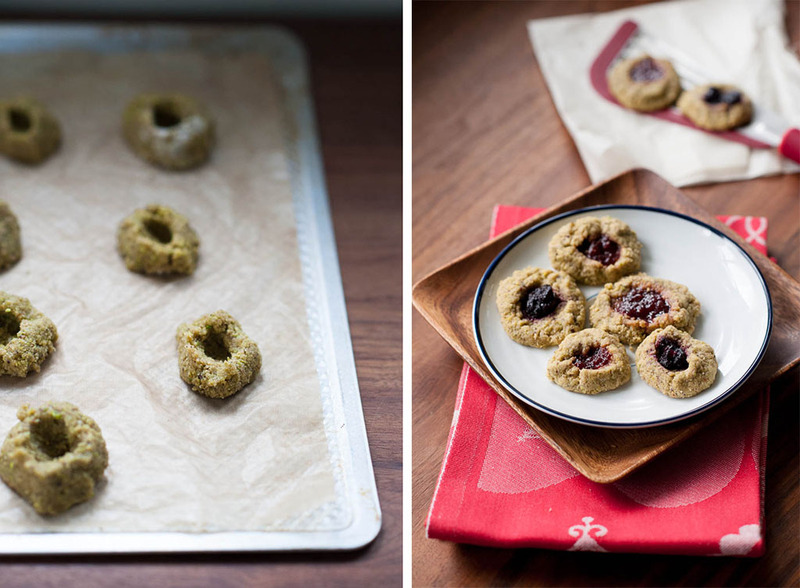 All of which leads me to this recipe for nut and whole grain cookies. While visually, the recipe has nothing to do with bread, mentally, I’m using it as a bookend. I exit 2013 with three months of consistent bread-baking in my past. I’ve baked all of my loaves with locally milled flour (either Fairhaven or Greenwillow), but most of those loaves, for the purpose of learning the baking process and fine-tuning factors like water temperature, have been made with white flour, and all of the loaves have been started with commercial yeast. This yeast, Saccharomyes cerevisiae, is a purified monoculture that is raised on molasses, before being washed, dried, and powdered. Commercial yeast exists to quickly put gas (air) in dough, but because it’s a monoculture, the resulting bread loses the complexity of flavor that comes from baking with a sourdough culture. When I flip open my new calendar and hang the January on my kitchen wall, I’ll start the process of cultivating my own sourdough starter, as well as baking some of my breads with whole wheat and whole grains. (Whole grains refers to any grain – from spelt, to barley, to amaranth, to oat – that contains the majority of the original seed: bran, which is the outer covering; germ, full of nutrients and minerals and capable of starting a new plant; and endosperm, the carbohydrates that feed the germ. Whole wheat refers to the seed from wheat grasses – spelt, kamut, hard red, durum). Because I didn’t want to develop a starter directly before traveling for the holidays, I baked these cookies as a mental and flavorful cue for future baking. Chad Robertson just published his latest book, Tartine No. 3, brimming with recipes for whole grain bread and pastry. 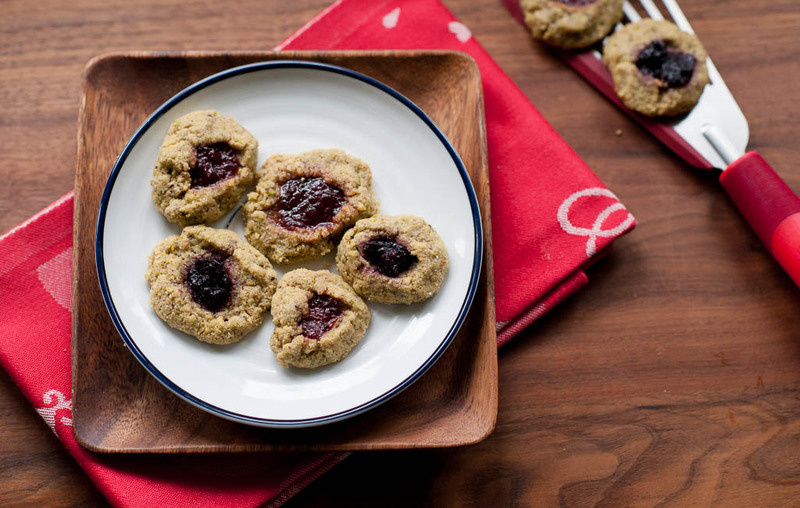 In tandem with the book’s publication, The New York Times shared his oat and whole-grain thumbprint cookie recipe as a pleasing, healthier alternative to the traditional shortbread sablé cookies baked with white flour. In Robertson’s online version, he constructs these cookies with pecans and rye flour; I chose to make them with pistachios – my all-time favorite nut – and oat flour. The combinations of nuts and flour are numerous, as long as you consider which nuts and flours will merge pleasingly together. The resulting cookies were surprising. First, they’re almost “no-bake” cookies: I had them in the oven for 12 minutes, just long enough to bind the ingredients. Once cooled and topped with jam, my first bite called to mind pistachio ice-cream topped with warm, rich oatmeal crumble. 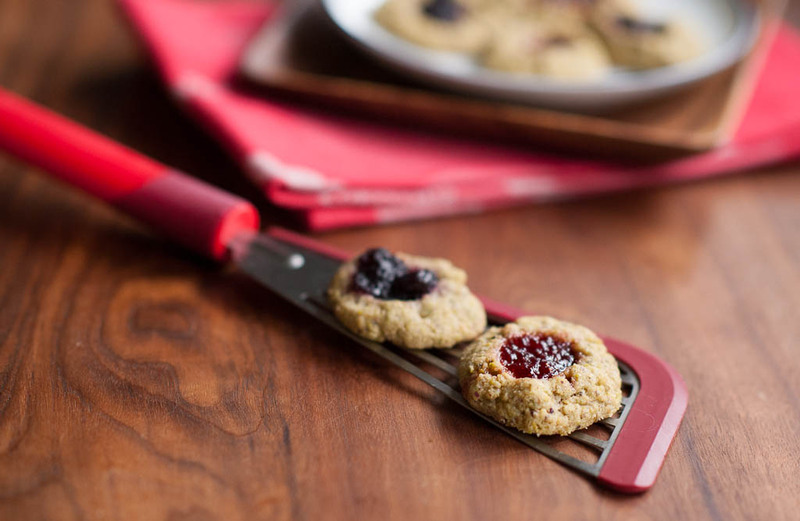 The dash of jam (in my case, strawberry and blueberry) provides a dollop of sweetness to this earthy, soft cookie. I found myself reaching for one after another, curious to tease apart the flavors. If you still have an urge to bake (or a need to bake) for a cookie party or holiday gathering, take pleasure in experimenting with Robertson’s base recipe to create a memorable nut and whole grain combination of your own. And don’t feel guilty as you reach for a third cookie; just think about those beneficial enzymes and amino acids you’re supplying your body! Heat oven to 350 degrees. 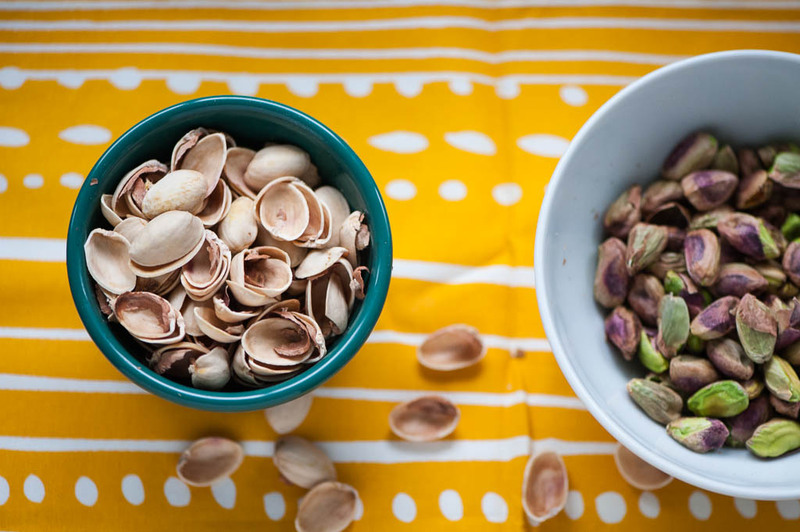 If not already toasted, spread pistachios on a baking sheet and toast until golden, 8 to 10 minutes. Remove from oven and let cool completely. Line two baking sheets with parchment paper or nonstick baking mats. 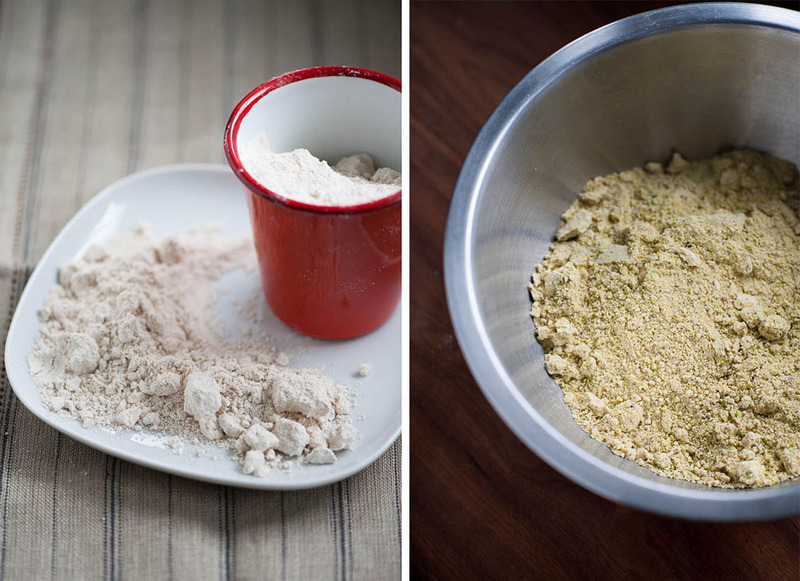 Turn dough out onto a lightly floured work surface and merge it together with your hands. Have a bowl of warm water nearby. Divide dough in half, dip your hands in water and roll each lump into a thin log, about 15 inches long and 1/2 inch across. (If rolling isn’t possible, gently push the log into the shape you want, redipping your hand in water as necessary.) Cut each log into 1/2-inch slices and roll each slice into a ball. Transfer balls to prepared pans, spacing them about 1/2 inch apart. Using your little finger to press into the top of each ball to make a well. As you press, use your other hand to hold the ball and shape it around your thumb and index finger into a small, flat-bottomed cup. Place the sheets in refrigerator and chill cookies for at least 30 minutes or up to 12 hours. Remove baking sheets from oven and let cookies cool completely. When ready to serve, use a pastry bag or a small spoon to fill each well with jam. Enjoy!